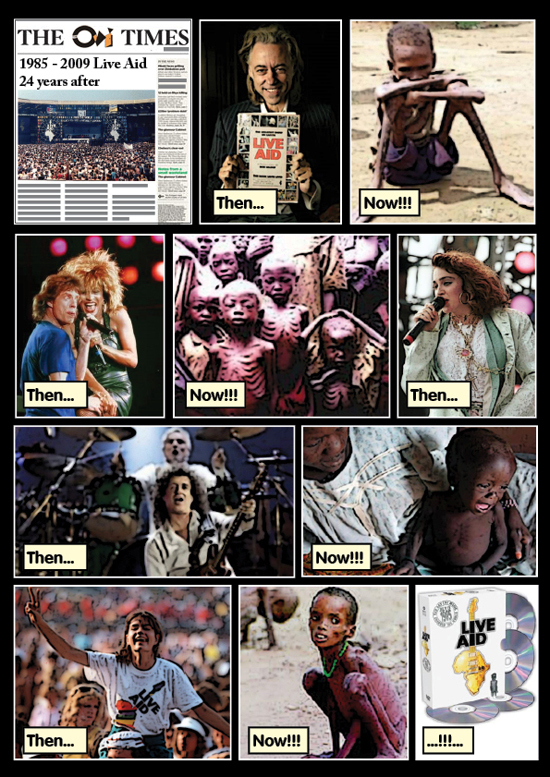 24 years after the Live Aid concert, a gigantic concert organized by Bob Geldof to raise money for Ethiopia and awareness to Africa’s problems. Boomtown Rats, Sting, Phil Collins, Bryan Ferry, David Gilmour, Paul Young, The Queen, U2, Dire Straits, David Bowie, The Who, Elton John, Joan Baez, Black Sabbath, Crosby – Stills & Nash, Bryan Adams, Eric Clapton, Madonna, Led Zeppelin, Mick Jagger, Bob Dylan, Neil Young, Santana, Tom Petty, B.B. King some of the musicians that participated in the event in London Wembley Stadium, Philadelphia JFK Stadium, Melbourne Australia, Cologne Germany, Hague Netherlands and Moscow USSR! And now …what?